The “Objects of Affection” exhibit draws upon the personal papers of families featured in the Re/Collecting Project, an online archive and ethnic studies memory project featuring families of California’s Central Coast, and directed by Grace Yeh, associate professor of ethnic studies at Cal Poly. Through stories, photographs, letters, songs, and performances, “Objects of Affection” explores the intimate lives of those within our diverse community. The exhibit shows the powerful ways people can forge rich community bonds and friendships in response to social and legal exclusion. • The exhibit is free and open to the public during regular library hours starting May 12 until June 15, 2014. Join us for an opening reception featuring spoken word and musical entertainment as well as authentic Filipino cuisine, May 23 in Kennedy Library’s 2nd floor Commons, 3PM-5PM. The Re/Collecting Project (Re/Co for short) is an online archive and ethnic studies memory project of California’s Central Coast directed by Grace Yeh, associate professor of Ethnic Studies. 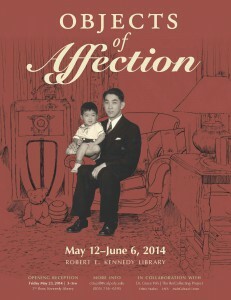 • The exhibit features Dr. Grace Yeh’s “Filipino Love Stories” exhibit, a project made possible with support from Cal Humanities, a partner of the NEH. Yes! Friday! It's 3:12pm right now.